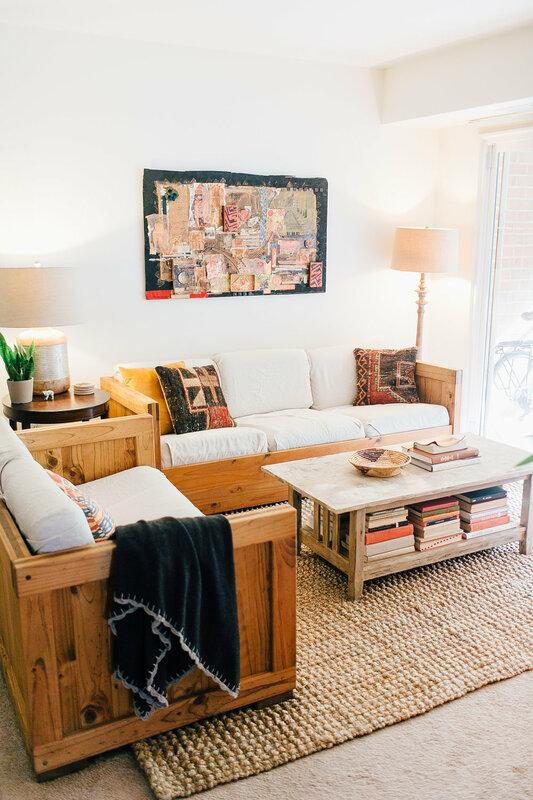 It may sound simple but incorporating trays into your home is a great way to minimize clutter! These objects are not just pretty and fun to use when styling but they are extremely useful in providing boundaries. They are only so wide, so deep, and so high. They can only hold so much. They force us to edit what we put into them. I personally love trays as a means for decoration and storage, and use them throughout our home. The fun thing about them is that they come in all shapes, sizes, and materials. I've found that they really take things to the next level. One of the spaces in our home that has been most transformed by the use of trays is our kitchen. As we are renting and on a budget, I haven't yet been able to make my wood shelf fantasy a reality, so instead I've had to be creative and improvise. On one side of the room is the fridge, stove, counter, and cabinets and the other is a little nook. In the past we housed a fold-up wooden table there, which held our microwave and toaster on it. It worked but it didn't satisfy my designer eye so one afternoon I decided to change things up. I had started to think about how I to could have stylish shelving in our rented apartment and asked my parents if I could have an old metal bookshelf of theirs. They agreed and so I brought it down to Williamsburg and set it up in our kitchen. As one of my favorite jobs to do as an interior stylist is to style shelves, I couldn't wait to get my hands on this piece! When it come to shelving, there is so much opportunity for what you can do using things as ordinary as cutting boards to special pieces such as paintings and collections. There is no difference when it comes to styling shelves in a kitchen. After getting the shelf set up and in place I begin styling it just like I would any other shelf: placing in the larger items first while paying attention to weight, color, and function. One of my goals was to add more warmth and natural elements to the room so I incorporated a lot of woven baskets, wood, and produce. A part of this "warmth" came about in the form our wooden trays which I used to create groupings. On one of the trays we have our collection of teas held in sleek, black tins along with our iron tea pot. On the other, we have our go-to snacks held in clear, glass jars. I pushed these trays to the outer edges of the shelf to spread the warmth of the wood and to give it some weight. In the middle of the two trays is a engraved brass tray that I got on a trip to High Point, holding a bowl of fruit. So not only are these trays beautifully styled but they are functional too. You can achieve the same thing in any room of your home taking pieces such as our simple metal shelf to the next level. 1.) 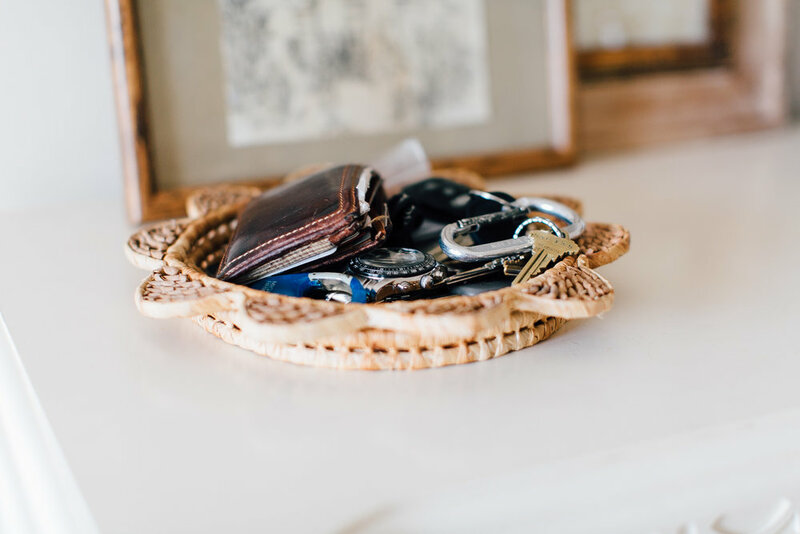 Place a tray near the entry way of your door for your keys and sunglasses. 2.) Incorporate trays in the kitchen. I have this one on the counter which holds our milk-glass pitcher full of wooden spoons and whisks, our butter, vino, salt and pepper. 3.) Use trays to create stations in the home. Our family has done this in our kitchen by using wooden trays (similar to these) to contain our tea collection and go-to snacks. 4.) Using trays in your home is a nice way of incorporating sentimental pieces into your every day life. The tray that now holds my makeup brushes is something that I often played with as a child, using it to hold a matching teapot, creamer, and sugar dish. 5.) Elevate a rather ordinary space such as your bathroom with the addition of a tray. I believe that if your going to be spending time in a space every day that it should be not only functional but beautiful as well. To create a more spa-like feel in our bathroom I used an old, vintage tray to hold some of my bathroom essentials.